Many homeowners do not pay attention to the importance of their outlet even if they have been plugging and unplugging their gadgets and appliances from it every day. It is very significant to always know the condition of any home outlet. A broken or cracked outlet can seriously lead to the risk of electrical shock and in worst cases, electrical fire. 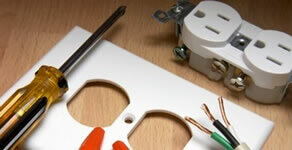 That is why outlet repair in Atlanta, GA is available to protect you and your family from this hazard. If you have any of these issues with your outlets, you need to call a professional for outlet repair in Atlanta, GA as soon as possible.